We are at the forefront of innovation with this room and want to stay out front. Take a moment to give us your feedback – what works well, what needs work – in the Riffe Active Learning Classroom. 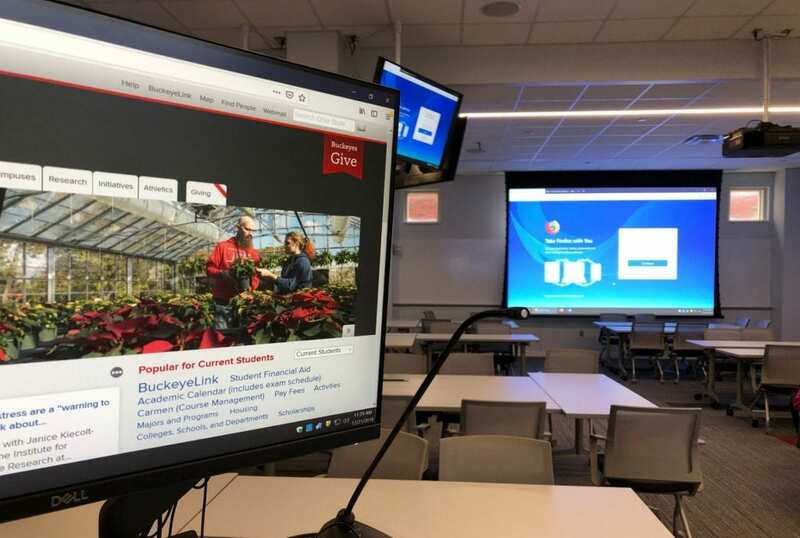 The Riffe Active Learning Classroom (Riffe 112A) is the largest fully flexible Active Learning Classroom on the Ohio State Campus. It seats 150 people for group work, lecture or presentations. The room can be split into two mid-size classrooms to maximize use of available classroom space, and the chairs, tables and podiums can be reconfigured for a variety of active learning formats. In addition, there are thirteen screens and six wireless microphones available to enable students to participate more fully. If you have an issue that needs immediate attention, you can contact the following people for assistance.